After the defeat of the combined French and Spanish fleets at Trafalgar, the Royal Navy approached the Victorian period with no major enemy fleet to fight. The British dominated the seas, acting as the policeman of the oceans until threatened by the German naval rearmament programme in the run up to World War One. It was on land that the naval officers and sailors fought the enemy – often in colonial conflicts - and many of the later renowned Admirals won fame in land battles – Beatty was a Lieutenant in command of a gun boat going up the Nile during the Fashoda incident with France and Jellicoe was shot in the chest during an attempt to relieve the Peking delegation during the Boxer rebellion. Meanwhile, Beresford and Arthus Wilson both fought in the Sudan, the former being speared in the hand, whilst the latter won the Victoria Cross after fighting first with his sword hilt and then with his fists. Other nations also landed navy landing parties to fight in their, sometimes colonial, conflicts abroad – France in Indochina and Mexico, the U.S.A. in Mexico and the Philippines, Germany in Africa and in the Pacific. On a rather windy day and in the company of two steam picket boats, men of the Royal Navy in cutters and whalers row ashore to take part in an exercise to land a force onto a beach. Judging by the peaked caps, the men rowing are Royal Marines with sailors in charge of the boats. A rather leisurely landing exercise is underway here. The sailors have rowed the cutters to the shore. The oars are stowed away and the mast has been unstepped. The sailors are armed with rifles. Things are a bit more lively in this photograph, a French Navy landing party led by several officers and petty officers is coming over the dunes, we can imagine them screaming and shouting like a wild horde. U.S. Navy sailors along with some officers are, in a somewhat disorderly fashion, boarding cutters to be towed ashore. The men have their backpacks, ammunition pouches and rifles. A sailor bottom right seems to be holding a Lewis gun, invented by the U.S. Army Colonel I.N. Lewis (but not adopted at first by the U.S. armed forces) and produced under licence by the British company Birmingham Small Arms. A squad of ten British sailors are drilling with rifles on board a Royal Navy warship whilst other sailors look on. The model of bayonet is longer than in the previous photograph and they seem to be using the old Lee-Enfield mk1. Even the smallest ship would have sailors trained in the use of a rifle. Here a group of sailors are training on board a small French torpedo boat. The pronounced curve on the stock of this rifle suggests that it is a Mauser 98. The German sailor is wearing sea boots and has two ammunition pouches on his belt. The object over his shoulder is probably a canvas bed-roll. These sailors on board the Austro-Hungarian destroyer S.M.S. Orjen are training with Roth Steyr pistols. This pistol was powerful and would be useful in close combat. We can see the ten-round clip feed sticking up from breech block as well as part of the bolt projecting back from the barrel. This is a good view of an over-100-strong landing party from the County class heavy cruiser H.M.S. London in Malta at some time prior to the Second World War. Three well-buffed up 12 pounder guns are shown alongside the limbers with part of the pulling strops seen in the foreground. There are several men with Lewis guns in the landing party - second man in from the right front rank, fifth man in from the left front rank, fourth man in third rank right. These men carry revolvers. Other sailors to the far rear left are also without rifles and may constitute the gun pulling party. This is quite a large landing party and it may be turned out for a ceremony or a display rather than for an exercise. There is a Lieutenant behind the middle gun and the officer in charge of the party has interesting cuff lace – two stripes with maybe a thin stripe between on a dark coloured cloth. Could this be a Lieutenant Commander, ordnance? A Naval Brigade parading at the Coronation of King George V and Queen Mary, 23rd June 1911. We can clearly see the pulling parties for the two guns – four men on the shaft of the limber and eighteen on the strops. Note the Sennet hats. King George V was a Navy man and a fleet review followed the next day. Years later, at the funeral of King George V, the coffin was placed on a Navy gun carriage pulled by sailors. This photograph shows a 3-inch gun of the U.S. Marine Corps after being landed in 1927, probably at Tientsin, the recoil cylinder is beneath the barrel, it has a sliding breech and a gun shield. There is a hand-screw for elevation just below the breech and a gun sight mounting above and slightly forward of this hand-screw, note the rectangular cut-out in the gun shield to allow sighting. In the face of civil unrest and riots during the Northern Expedition by Chiang Kai Shek's Nationalist forces, regiments of the U.S. Marine Corps were shipped over to Shanghai in the troopship U.S.S. Henderson with the aim of protecting American citizens and property in the concessions. Part of the force re-embarked and U.S.S. Henderson sailed to Tientsin (now Tianjin) to disembark marines in anticipation of the defence of the foreign delegations in Peking. This photograph shows marines being transferred to barges prior to landing whilst the troopship was at anchor off Tientsin. Strangely, the accompanying tug is registered in Shanghai. Note the heavy lift crane at the after end of the superstructure and the stack of large boats further aft. A marine aircraft squadron was also shipped out and we can see a floatplane in the upper right background, it looks like a Vought VE-9 with a central float. The field gun race at the Royal Tournament celebrated the role of the Navy landing party in the relief of the British garrison at Ladysmith during the Second Boer War in 1899. The Royal Navy landed six naval guns and during the final stage of the journey to Ladysmith, the guns were manhandled over the rough South African veldt. The field gun weighed 675 kg and the limber 265 kg, both being taken over obstacles and raced around the arena by two competing teams much to the joy of the spectators at the Royal Tournament from 1907 onwards. H.M.S. Vivid - a training base up to 1914 - was a Navy barracks at Devonport from 1890 to 1934 when it was renamed H.M.S. Drake. Note the bulldog mascot. Men from the French Marine Nationale are on exercise with several field guns . Sailors are positioning the light gun, one man is holding the rammer, whilst the gun limbers are held back. The 65mm gun appears to have a rotating screw breech with no recoil mechanism. The British battleship H.M.S. Marlborough was steaming to Malta when this photograph of a landing party of about 30 men and three officers was taken. The officers and men have backpacks and webbing, the officer with his back to the photographer has a binocular case attached to his belt. Several of the men are looking over their right shoulder and seem to be a bit wary of the state of the sea, not without reason (see verso)! This landing party is parading during the 1910 celebration of the French interventions in Mexico during the mid-1800s. Shortly after the celebrations there was a revolution in Mexico on 20th November 1910 and the President Diaz was overthrown and fled to France. Here is a small landing party ready for service in Hong Kong some time in the 1930s. There is a Lieutenant and a Chief Petty Officer with two long service stripes (note the small horizontal stripe of unknown origin on the left sleeve above the crossed anchors badge). The men are armed with Lee-Enfield mark 3 rifles and are from H.M.S. Tamar, named after the British floating naval base of 1897 and becoming a shore establishment in Hong Kong. Note the small dog sitting by the Chief Petty Officer. Top Regular training of sailors to make up landing parties was important and these two photographs show the men of H.M.S. 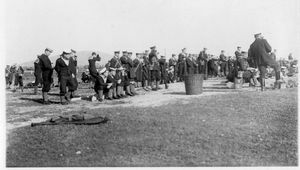 Benbow on the firing range in 1921. Bottom We can see the kerb indicating the safety line behind which the men must stand prior to taking up position on the range. The large basket may be for spent cartridge cases. 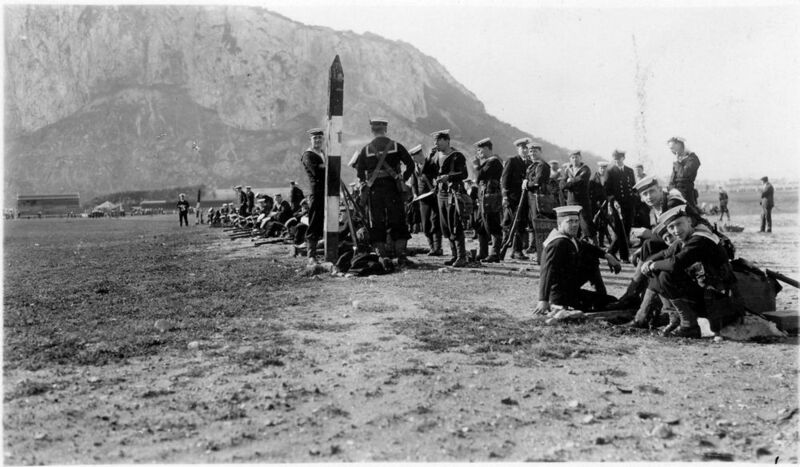 Under the watchful eye of a Petty officer and a Lieutenant, a group of sailors are practising rifle firing. This may be a posed photograph because the ship is in port, there are no empty cartridges on the deck and the sailors standing up do not really have a sturdy stance for firing. Note the sailor first left crouching has no shoes on. Proficiency in firing a rifle was all-important and, as for many other skills in the Navy, was the object of competition between ships. Here the team from H.M.S. Veronica has won the Bledisloe Cup. H.M.S. Veronica was an Acacia-class sloop of the Royal Navy, part of the New Zealand Division of the Royal Navy from 1920 to 1934. Note the standard Lee-Enfield mk3 rifles and the officer in the right background wearing white shorts, black stockings and black shoes. As well as maintaining order, Navy landing parties also performed humanitarian actions as seen here when men of the Royal Navy went to the aid of victims in Yokohama after the Great Kanto earthquake of 1923. At the time the Royal Navy maintained a military hospital and a base in the port of Yokohama. 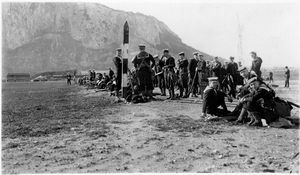 Such was the response of reservists (Royal Navy and Royal Marines) and volunteers to join the Royal Navy in 1914 that there was a surplus of sailors needed for service at sea. These men were formed up into an infantry division initially named the Royal Naval Division which subsequently fought in Antwerp, Gallipoli and on the Western Front. 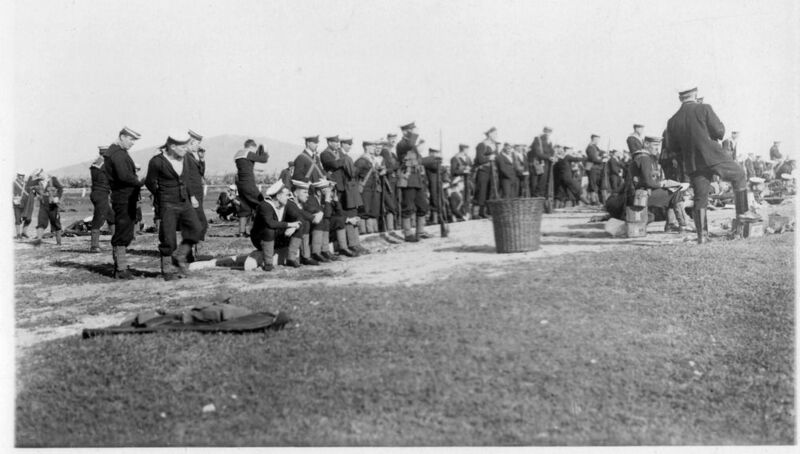 Whilst on land, the Division still retained its naval traditions and language. This photograph shows a crowd of Royal Naval Division men, many of whom appear to be very young, in, perhaps, a Royal Sailors’ Rest. Tea has been served by the ladies at the back of the hall and on the table there are copies of “The Sunday at Home” and the magazine “Ashore and Afloat”. Royal Sailors’ Rests (Plymouth had two and Portsmouth one) and “Ashore and Afloat” were the results of the remarkable efforts of Dame Agnes Weston who worked intensely for the well-being of sailors, notably by promoting temperance societies.